Nepal’s formal diplomatic contacts with the then East Pakistan started with the establishment of the Consulate General’s Office in Dhaka in 1967. Mr. Laxman Bahadur Singh was the first Consul General of Nepal, who was succeeded by Mr. Madhav Kumar Rimal, and Mrs. Bindeshowri Shah respectively. Following the establishment of diplomatic relations with Bangladesh in April 1972 , Nepal opened its full-fledged diplomatic mission in Dhaka in 1976. After the establishment of the Embassy, Mrs. Shah discharged the responsibility as the Charge d’ Affairs of the Embassy for some time until the appointment of Nepal’s full-fledged Ambassador to Bangladesh in 1976. The Embassy of Nepal was located in Dhanmondi till 1983 before it moved to its new chancery building in 1985 in Baridhara Diplomatic Enclave having its own unique design and architecture portraying the pagoda style of Nepal. The late King Birendra inaugurated the Chancery Building in 1985. All wooden works, traditionally crafted windows and doors, were brought from Nepal to give the buildings a touch of Nepali architecture. The Embassy complex consists of Ambassador’s residence, diplomatic staff quarters with sprawling garden. Pashupatinath temple was built inside the Embassy compound in 1999 with the cooperation of the Nepalese community in Dhaka. H.E. 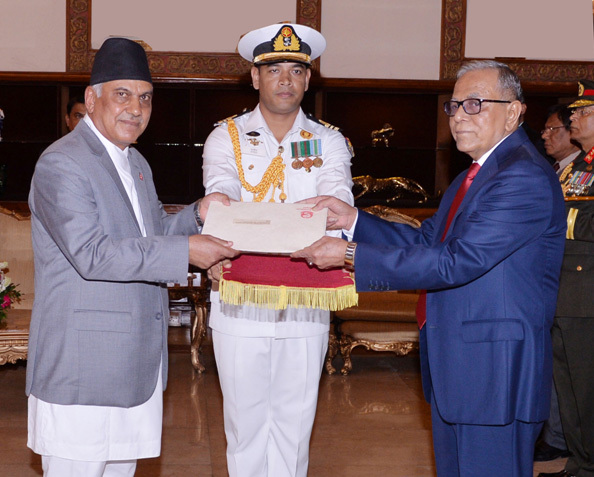 Prof. Dr. Chop Lal Bhusal is currently serving as the Ambassador of Nepal to Bangladesh since July 2017.